No matter what the wall is, Nippon Paint perfectly colours the surface and also satisfies every taste. Our products are the ideal concoction of innovation and beauty. We have got the right paint to complete your look. Browse through our extensive collection of emulsions (for both interiors & exteriors), enamels, undercoats for a wide range of surfaces from cement to metal to wood. NIPPON PAINT PRO STORE is the complete painting solutions to your dream houses, corporate offices and housing structures. Get in touch with us with your queries and get consultations with our experts for your projects. Why should I use Nippon Paint? Nippon Paint’s unique range of products not only caters to your aesthetic needs but also to your functional needs. 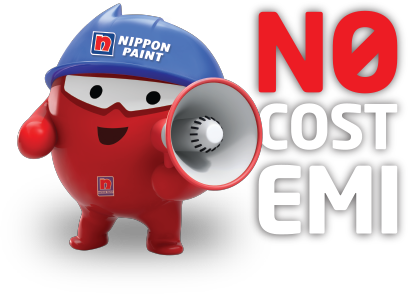 Besides having a wide range of colours, Nippon Paint offers specialty products such as anti-bacterial paint and low-odour paint. How is Nippon Paint different from others? Nippon Paint’s core focus is on green technology. We make and sell paints that are not only technologically advanced but also environment friendly. What many people do not know is that most paints have dangerous compounds in them called volatile organic compounds (VOCs). These compounds evaporate at room temperature and gives off gasses that cause nausea, dizziness, eye irritation, and even heart, lung, or kidney damage. Sometimes even cancer. Paint that smells strongly usually contains VOCs. Paints that do not have VOCs like Nippon Paint’s Odour-less AirCare are called eco-friendly paints. Best season to paint my home? About once every 3 years is recommended for interiors and once every 4 to 7 years for exteriors. Nippon’s Sumo has a life of 4 years while Weatherbond lasts up to 7 years. Interior paints, when maintained well, can last for up to 7 years. Wall surfaces chip and crack, metals rust and corrode, while wooden furniture and doors get warped and scratched. Different paints have distinctive, specific properties that prevent, or delay destruction to the surface. The paint forms a protective layer around the substrate, keeping it safe from damage. Is there any specific order to paint a home? Painting a room in the correct order will save time and money. Begin with the ceilings, followed by the walls (water-based paints usually applied), then the doors and windows (wood and metal specific paints will be required). Why do hairline cracks appear? The development of small cracks on inside plaster walls and ceilings is not unusual and is normally the result of movement of the building. However, large cracks that appear to be getting wider should be investigated by a professional.